View basket “CTX14 Swageless Compression Extenders” has been added to your basket. 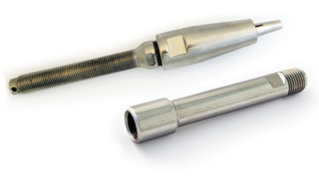 These extenders simply and easily extend the length of our standard swageless compression fittings. They can be used in a variety of applications such as fitting to existing stays when you have removed a damaged swage fitting and our standard swageless fittings are too short. Petersen Stainless Rigging Limited should be notified of any returns by phone, email or fax prior to them being sent back. You have a statutory duty to take reasonable care of the goods while in your possession and also to ensure that they are packaged sufficiently to avoid damage in transit. Returns will only be processed when all relevant details have been received, either by completing a ‘Returns Form’ (below) or sending the relevant details to us in writing/email. If we do not receive this information within 30 days of receipt of the returns, the item(s) will be disposed of and no further action will be taken. If the goods are delivered to you in a damaged or defective state, upon receipt of the returned item(s) a full investigation will be completed, corrective action will be implemented and a full refund or replacement will be processed. We will not be liable for any costs associated to the return unless they have been agreed in writing in advance. In the event that we deliver the wrong item(s) to you, upon receipt of the goods a full investigation will be completed, corrective action will be implemented and a full refund or replacement will be processed. We will not be liable for any costs associated to the return unless they have been agreed in writing in advance. Upon receipt of the goods a full investigation will be competed. If it is found that the items are being retuned due to a customer error, a refund may be approved. A handling charge of 20% will be charged. Petersen Stainless Rigging Limited is committed to continuous improvement. Any issues identified from our investigation, appropriate corrective actions will be implemented, where deemed necessary, to improve the quality of our customer service, product and processes. Petersen Stainless Rigging Limited, RETURNS DEPARTMENT, Cowen Road, Blaydon on Tyne, Tyne & Wear, NE21 5TW, UK, +44 (0)191 4140156. Or alternatively email us here. Website designed @ Blueleaf Studio. © 2019 Petersen Custom Rigging.